Their pairing in the blockbuster Johny Mera Naam is filmlore and decades later, Pran and Dev Anand again shared the stage as they were honoured by Dadasaheb Phalke Academy for their contribution to Bollywood. 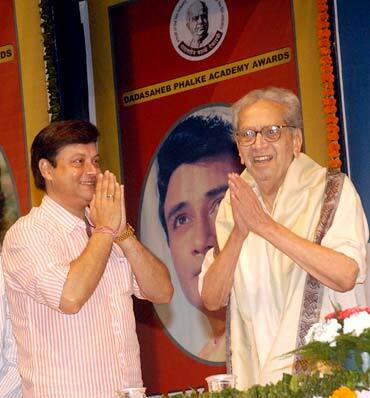 Pran, 90 received the Phalke icon and Legendary cine versatile star award while Dev Anand, 86 was honoured with the Phalke Ratna award. "I feel extremely proud and honoured to receive this highly esteemed award. I thank the industry for showering their love and support," said Pran. "I feel privileged to receive the award, I salute the Academy for considering me. 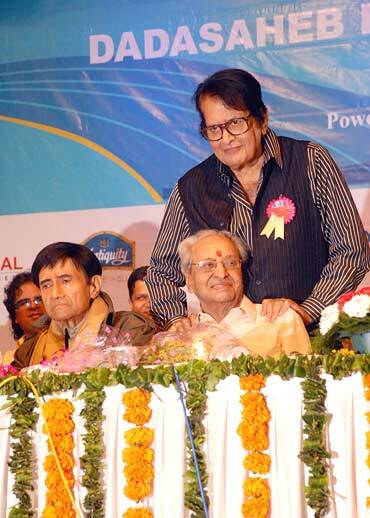 I bow to the Indian film industry for their love and support," said Dev Anand. The awards were presented by Maharashtra Deputy Chief Minister Chhagan Bhujbal amidst thunderous applause from the audience. "While watching Pran sahib's movie I used to hate his character. He did it with so much passion that everybody was bound to hate his role," Bhujbal said. "I remember I used to stand in long queues to buy ticket of Dev sahib's movie. His movies like Guide, Hum Dono, Khoya Khoya Chand and others are my favourite," he recalled. The Dadasaheb Phalke Academy awards, which coincided with the birth anniversary of Dadasaheb Phalke, Father of Indian Cinema, was held on April 30 at Bhaidas Hall in Mumbai. Shammi Kapoor's son is ready to rumble! Deepika Padukone: Why the fuss over a bikini?